Kicking techniques are your longest range weapons in barehanded fighting. Advantages: Kicking techniques can give you a huge advantage because of the inherent power of the kicks, the longer reach and also because many opponents are not trained in kicking or kick defense. You can strike from outside their effective weapon range with powerful strikes that are hard for the untrained to defend against. Disadvantages: Kicks are slower than hands and tend to “telegraph” so are easier to see and anticipate. Giving away your intent can create opportunities for the opponent. Kicking also necessitates temporarily stopping and standing immobile on the “single point” base leg while executing the kick. Done properly these issues can be overcome but you should understand how to handle them. This is the range of hand striking. It is the most common range. Even untrained fighters use this range. Advantages: Hand strikes are fast and effective. They land on target almost twice as fast as kicks. (part of that is they are initiated from a closer range and are a lighter weapon than kicks). 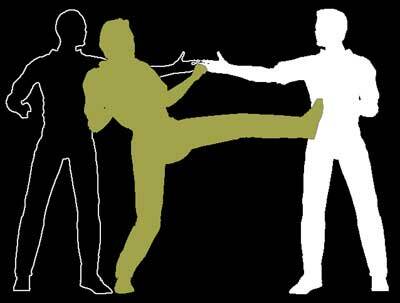 Unlike kicking you can remain mobile while you are executing your hand strike combinations. Mobility is a huge advantage you want to retain. Add in techniques and concepts like: closing gaps, entering, stop hits etc and hand strike become even more effective. Disadvantages: Everyone else can punch too. Even if they don’t do it technically correct they can still do damage. So unless you are significantly taller than your opponent you are in range of their strikes while you are bringing your hand strikes into range. Also people tend to want to strike to the head with punches and if done improperly can end up injuring or breaking their hands. The weakest link in the chain is the one that breaks. Skulls are much solider than your knuckles and the small bones of your hand. Hurting yourself with your own power is a bad way to start a self defensive sequence. Infighting range is the closest striking range. Because of the extremely short range and power of the main techniques this is the fastest and most dangerous of the ranges. Advantages: This is a very combative range. The main techniques of the range (usually elbow strikes and knee strikes) are very powerful but are also delivered very quickly. this is also the range that the average opponent is least familiar with. 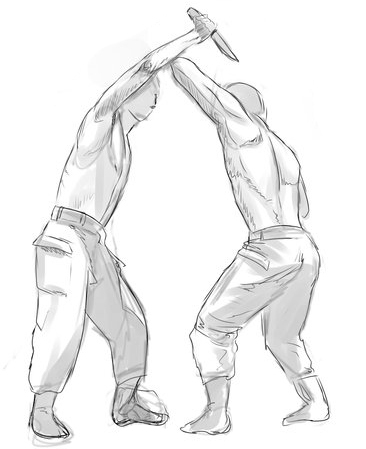 Most people are familiar with kicking and everyone can punch and wrestle but very few people understand anything about infighting range and the systems that specialize in it (wing chun kung fu, Jeet kune do, pentjak silat. kali etc) are lesser known. Disadvantages: Strikes can be delivered very quickly so you don’t have a lot of time to defend yourself. So you need to have the initiative and be on the attack (holding centerline etc) and let your offense defend you. If you stall out in this range you are going to be in trouble. Grappling range is the closest fighting range. Usually it will end up on the ground. 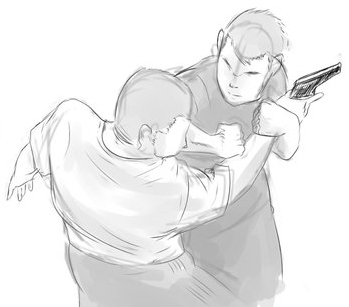 It is a very common range because many fights end up with one or both people on the ground. It is easy to get knocked down, taken down or just fall down during a fight. A 2 point stance is inherently unstable and it easy to be taken out of it. Advantages: Everyone can grapple but most people don’t do it skillfully. They just try to muscle their way through. They are open to chokes, locks and strikes and don’t know how to defend against them. In a less serious conflict you can also use the range to “smother” an opponent’s attempts to strike you. You can pin them or apply a submission hold without doing significant damage if you need to. Disadvantages: People train for grappling on mats but many of the techniques will not be as effective or easy to do on concrete or hard surfaces. Hitting your elbows and knees on the ground is going to hurt and may damage your body if you land wrong.